Scott Pitts is a pro fishing guide from Oregon and he and his wife, Sara, came down specifically to jump on some roosters! This particular day, they caught and released big fish including this great double hook-up! Lots of Oregon amigos lately! 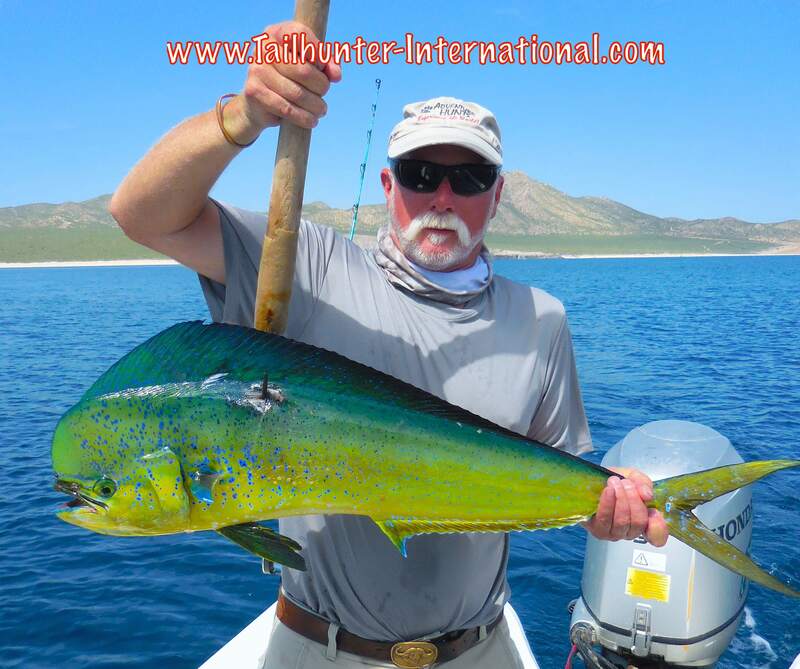 Ken Chaplin is a hunting outfitter and did good on the roosters and dorado like this really colorful bull dorado! 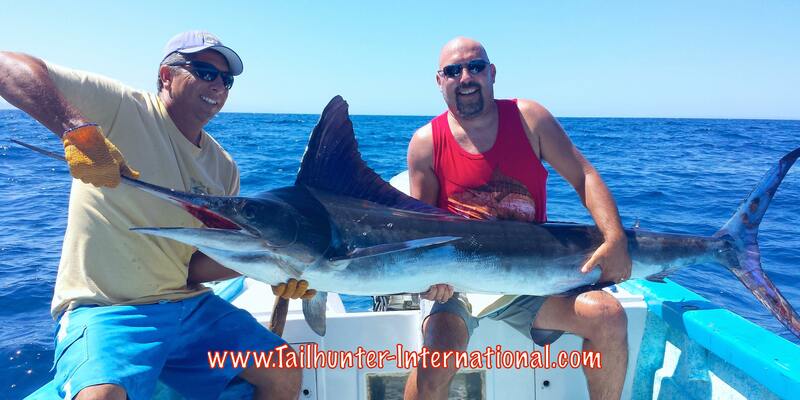 Big smiles with Captain Joel and Scott Pitts for a big striped marlin they caught north of La Paz Bay and released. 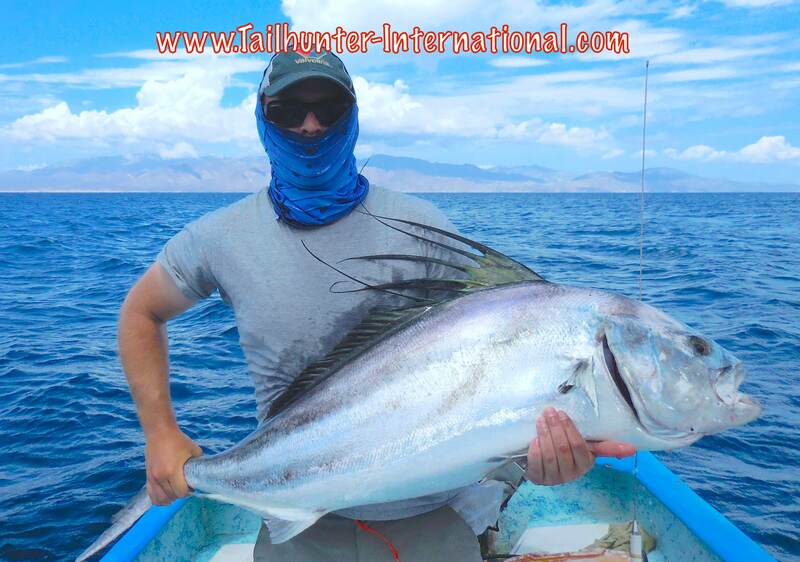 The man behind the mask is our Seattle amigo, Dustin Chaplin, with another big fat roosterfish. Caught and released several nice ones. I think this looks like the summer pattern for the season. Maybe in a few weeks it will change, but for now, it appears that the fishing reports are getting pretty consistent. Hot humid weather with occasional afternoon showers. 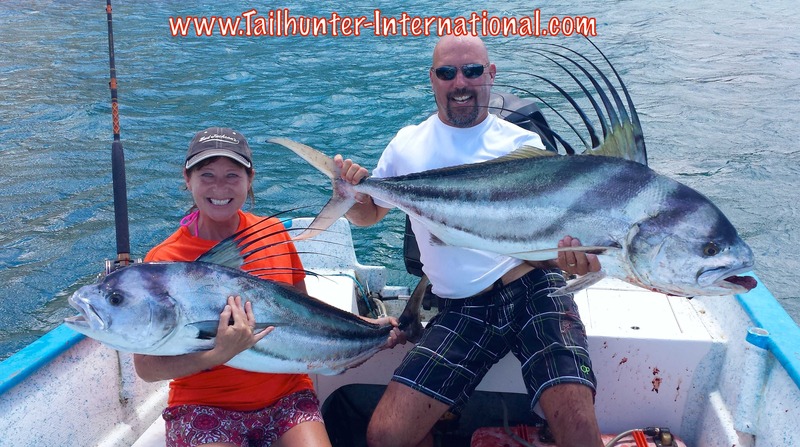 Great beach days and fishing fairly solid for three main species…rooster fish…dorado…and billfish. Still earning it’s nickname as the “Roosterfish Capital of the World.” If you’re targeting rooster fish, it’s been an excellent season for them. Some days are better than others, but overall, if pez gallos are on your bucket list and you have a day or two, you’ve got a good shot at taking in a trophy. There’s some fun little dinky-guys in Bahia de Los Suenos running a 1-3 pounds that are a hoot on light tackle and flyrods. Then…there are the beasty boyz! The rest of the fish are tackle busters. The “smaller ones” are 25-30 pounds. The larger ones are up to 60 pounds. And they get larger! We have caught them over 100 pounds through the years and some big guys have been lost. The world record 114-pounder was taken in this area. The key is having either sabalo (ladyfish) or caballito (jacks) for bait. On the days when it was a little too windy or bumpy to get the baits, those were the days when the rooster bite was off. But, if you have the baits in the tanks, then you’d better buckle in. The fish surprise alot of people to find fish this size literally just a few yards off the beach in shallow water. The baits themselves can be as big as 12 inches. So, anything that can put a 12-inch bait in it’s mouth is gonna be big! Beyond that, some billfish getting hooked and a few school dorado and cabrilla. Fishing with our Tailhunter La Paz fleet, the dorado have been the highlight. There’s several spots north of La Paz Bay that are holding lots of fish. That’s the good news. The bad news is that so many of the fish are 5 pounders. Ready to eat anything you throw at them and there’s plenty of action. There’s larger ones hanging out up to about 20 pounds, but the little “doraditos” are so plentiful, the larger ones don’t get the chance. However, I will say that more of the bigger fish came up later in the week and it was a marked improvement! Still, we’re hooking some larger ones each week and the smaller ones are providing lots of fun action so everyone gets bent. For other species, with so many little dorado around, the billfish are feeding in the same areas on the small dorado so we’re hooking marlin and sails in the same areas as the dorado. Big bonito also that pull like freight trains. Inshore, the waters are getting almost too warm, but there’s still some pargo and cabrilla along the rocks as well as smaller rooster fish. High-five’s to this week’s big hearts who brought down stuff in their empty bags and ice chests for Jill’s “Pack for a Purpose” program to benefit needy kids here in La Paz! 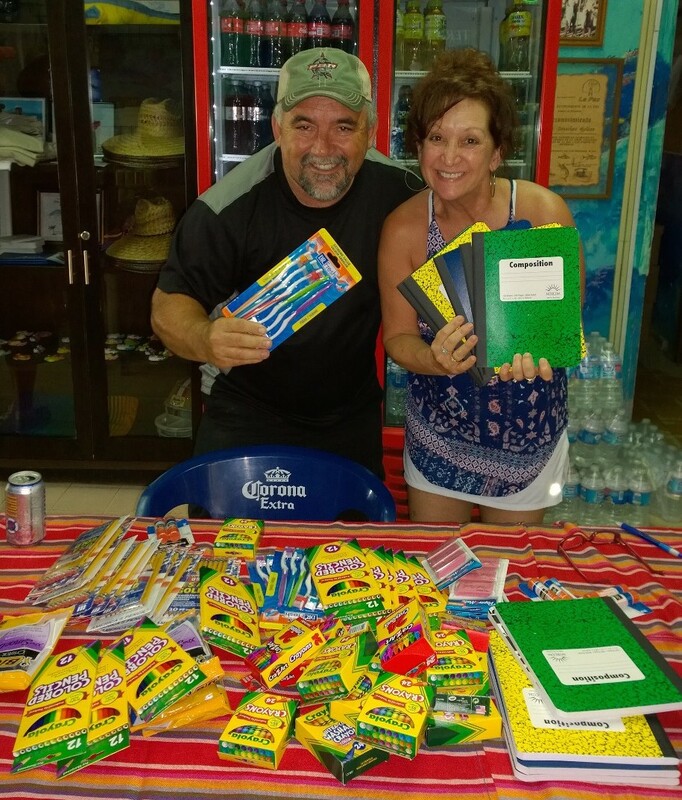 Just-in-time for the school year for kids that can’t get supplies, John Christofferson, who runs a huge barbecue catering biz in Las Vegas showed up with some great stuff for Jill’s Pack for a Purpose Charity. 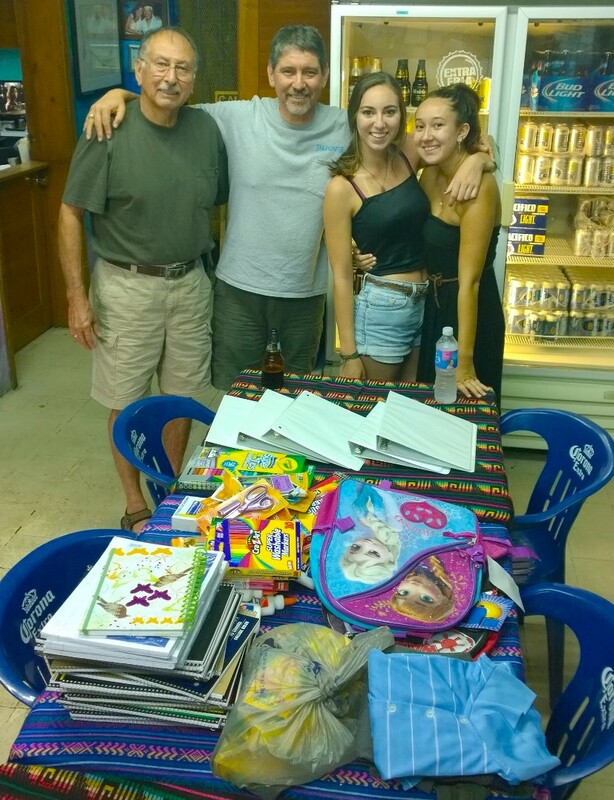 The Chacon Family (Rich, Hector, Lauren and friend Izzy) can give anyone a lesson in how to cram a ton of stuff into small places! Every year, they bring down clothes, supplies, school materials and so much more for the kids! 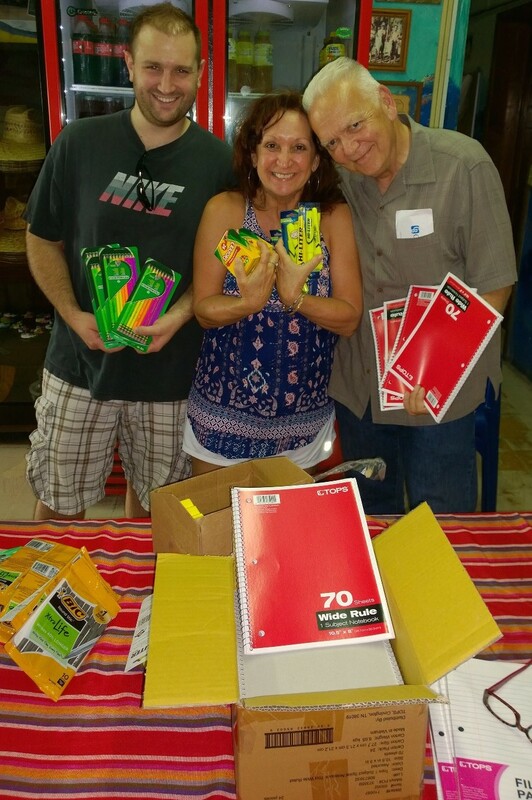 He’s got a sly smile, but a big heart…Paul Zech with son, Mike, from Oregon come to see us every year and pose with Jill and a big load of things for the kids! Thanks, guys!